The Kulturforum is to be regarded as a collection of remainder excrements, fragments torn from the culture that produced them and left scattered like so many broken statues. Manfred Sundermann had the right idea when he suggested transporting one of them to the Altes Museum, but why stop at placing it outside? 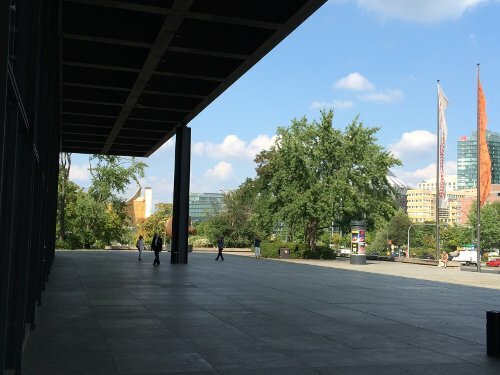 The Neue Nationalgalerie should be installed in the Rotunda, the Philarmonie enscribed in the Thesaurus Brandenburgicus Selectus and the Wissenschaftszentrum visited only occasionally by wealthy Prussian patrons. These are monuments, not to Bacchus or Diana, but to every urban planning movement of the twentieth century – garden city movement, das neue bauen, expressionism, organic functionalism, postmodernism – and at least four distinct phases in the history of Berlin - Prussia, National Socialism, The Cold War and Reunification – and fused together in a kind of urban anastylosis. And the fragment rising above all the others is the great relic of the mid-twentieth century: the automobile. Although Scharoun’s curving and undulating organic urban planning was a reaction against all number of Reiche, it was, lest we forget, to be navigated by car, nature’s final dominion to shift-stick convenience. The Kulturforum is best experienced through your car window, which will be closed for your security. The Philharmonie is Europe’s largest drive-in theatre. Refreshments are available in the lobby (at reasonable prices). This is the autopia that Walt dreamed of, not a Tomorrowland, but a land of tomorrows past. The charming combination of tarmac and wasteland (not yet nuclear, but as much the product of the Cold War as any hydrogen bomb), will leave you in no doubt that bipedal evolution was a fool's errand, just try walking to potsdamer platz and see how far you get (spiritually). O potsdamer platz! You great symbol of reunified Berlin. This time things would be different. It was the end of history and we were, for ideology now, much too cynical. Well this then is an architecture of cynicism. Cynical that any notion of public space melts into air when confronted with dissident or undesirable activity. Cynical that the planners returned to the radial boulevards of so many Reiche. Cynical that architecture without hope is just buildings. O potsdamer platz, the great white hope of reunified Berlin, you now swallow up the Kulturforum in a grotesque shadow. Grotesque not because of light and shade, the great motif of the expressionists, which relies on an outdated division between interiority and exteriority (Dr. Caligari posters are available in the gift shop), but because of the very absence of light and shade. The shadow that falls on the Kulturforum is transparent. This then is a time to return to the obscured, the unperceivable, the imperceptible. Tiergartenstraße separates the walkable space of Tiergarten and the barren autopia of the Kulturforum. It is a ring road for the political class, one that circumnavigates human interaction. The Kulturforum is for them an ornate traffic jam, Tiergartenstr. 4, a vulgar petrol station. After Tiergarten was made a public park in 1790, the villas that appeared in the area make clear that the Matthäus-Viertel, at one time, was a space produced by the presence of Tiergarten. And Tiergarten was used and developed by the people of Matthäus-Viertel. With no doubt a sense of historical irony, Tiergartenstraße constructs a great border between these dialectically connected spaces. And for all the failings, perhaps the worst at the Kulturforum is that the buildings fail to interact with one another. There is no dialogue between them (which is apt, because the conversation stopped in 1989). The square pediment upon which the Neue Nationalgalerie sits renders it inaccessible. Actions take place within each separate building and are not articulated in the shared space outside. The concept of Kulturforum is ill-defined at best. And at this point we might ask, ›whose culture?‹ and what for? Is this what culture looks like in the 21st century? Marx once said that »dead generations weigh like a nightmare on the brains of the living.« In modern-day Germany, it is the still living generations who weigh like a nightmare. That generation who told us everything has its price have occupied our cultural institutions and they’re not giving them back. This is cultural hegemony rendered only in grey tones. We demand, instead of a collection of remainder excrements, the Kulturforum be a Gesamtkunstwerk, one that is produced by a recognisable, contemporary, urban context. We demand the destruction of the world’s largest drive-in theatre and the introduction of a walkable, spontaneous, shared, public space. We take the word Kulturforum on its own terms: that is a forum of culture(s). In 1963, the year the Philarmonie opened, an article by Jan Despo was published in Bauen + Wohnen called Das neuzeitliche Kulturzentrum: die Agora. This, for us, was both historical context and design starting point. The Kulturforum, however, with its combination of both interior and exterior spaces, was always more forum than agora. These exterior spaces are to be developed. Scharoun himself always sought to collapse interiority and exteriority into a dialectical relationship. The functions of the institutions must therefore be brought outside and made freely accessible. We understand that the Baby Boomers are the biggest benefactors of cultural institutions, but they must not be allowed to monopolise culture. We will seek to bring more diverse users to the Kulturforum. A return to and a renewal of forum as concept will challenge the current dominance of Potsdamer Platz. Where Potsdamer Platz has pseudo-public space, the Kulturforum must be really existing public space. Public space, for us, is not simply bars, restaurants and shops. To force this change, we will take the radical action of removing Tiergartenstraße, the ring road of the political class, and Tiergarten will be allowed to spill over the north of the Kulturforum. In this newly created dionysian space, there will be equally dionysian architecture. Temporary wooden structures built by architecture students, ecological groups or festival stage designers as experiments in form and living.